It was really eas y to get angry when the tourist agent begged us to wait until 2 p.m. to check into our hotel when we arrived at Phu Quoc Island about 8:30 a.m. So, instead of relaxing and taking a shower and getting changed into fresh clothes we were stuck outside with our bags. Our trip was short with only three days to explore our new destination, we felt it was a waste of our time but anger doesn’t get you anywhere. 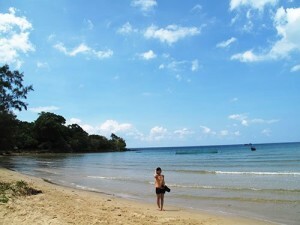 We decided to find a backup plan and finally chose Bai Dai Beach as compensation for the admin error. And you know what, as plan B’s go this was a good one. The beach, one of the must-see destinations in Phu Quoc Island off Kien Giang Province, stretches 15 kilometers along the northwestern coastline of Phu Quoc from Ganh Dau Cape to Cua Can and is attractive due to its crystal-clear water and smooth golden sand. 11 a.m. was not an ideal time for swimming due to the fierce sun even at that time. However, we couldn’t resist the beauty and romantic setting with the clear blue sea, cool wind and shaded coconut lines, as we jumped into the refreshing water. In that moment we washed away the stresses of urban life as we admired the primitive beauty, swam with the fish, listened to the whispers of waves and let the wind blow over your hair. After taking many memorable photos, drinking fresh coconut water and taking some fried shrimp, we took a short nap on hammocks in the shade. After a little shuteye we went back to the hotel revitalized and later in the afternoon were taken to the pepper plantation and a fish sauce firm to learn more about the process of making local specialties and shopping for gifts for our friends and family.